Official website of Rustam Gelmanov. Professional rock climber Rustam Gelmanov had a dream - to express climbing and the emotional journey a climber experiences through music. Musicians Long Arm & Ruslan Gazhgimuradov teamed up in a collaboration inspired by Rustam's dream, to realize his dream and compose the journey of a climber as they set out to conquer a new face. I was invited to the event which reminded me the story of Hemingway «The Dangerous Summer». Bullfighting, blood, fear in people's eyes, joyful voices and desperate lightning movements of Torrero, euphoric fighting for life. I am one of the participants of deep water solo event, which is held in the famous by bullfight Spanish city, Pamplona. Nearby in Puente la Reina, there is legendary bridge, in which long time ago Pilgrims walked. This bridge will be in our hands, and underfoot is a shallow river, which was differently accepting flying without prejudice to the people. And who is 'flying'? – Yes, they are not just athletes, they are wonderful actors waiting for the roar of the audience that does not push them away. Charismatic, each with its own style and different attitude. Years of experience can be seen by calm look in stressful conditions. You can almost touch the outgoing force, it so evident when a group of such athletes gathered together in one place for a common goal. Once in my email I saw the letter which did not leave me other choice as to say "YES". I had to say "yes" to the invitation from far away country Singapore. 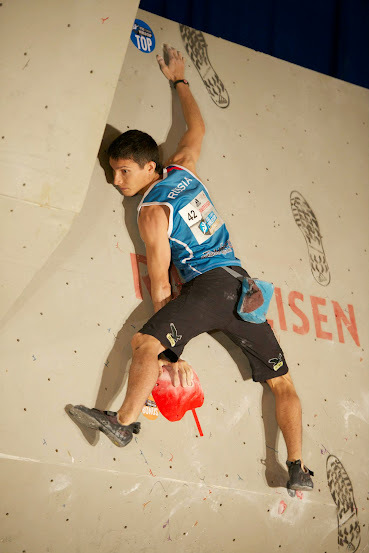 I was invited, firstly, as a route setter for the competition NUS Boulderactive, and, secondary, as not such a bad climber)) It was nice that the invitation came long before the event and we could plan it inbetween my competitions. Many emails about coming event, a lot of details. Immediately after the World Cup in Laval I flew to Singapore in anticipation of a tropical climate, where I feel like at home. I was tired after the worldcup I arrived and my expectations came true. Hot and humid, I was sweating after a few meters after I crossed the door of the airport, which separated me from the air conditioner. I know that I'm getting used to the climate quickly, just need to wait a bit. Guys met hearty welcomed me. Sitting in the car I was sure that now we will go for dinner and then sleep, it was about 6 pm. But I've decided to ask and got stunning response. Yes, as I thought dinner will be right now, but then from 9 pm to 3 am we will set routes. Not showing my surprise like I was expecting such a graphic, I was trying to understand how is it possible that so soon after the worldcup and the flight I had to do something. But perhaps it was on the right moment, I reached a new level of efficiency, from that moment on I only needed food, sleep was no longer so necessary. After the first day already I felt that the guys here are very good, all very responsible and know their business. It will be impossible to prepare bad competition. I slept for 4 hours and it was a start of the new day which was practically continuing for two days: many events and only lunches and dinners in the local caterers worth a lot. So many memories with an indescribable emotions. Atmosphere of Asian disorder in this luxurious place simply does not fit in my head. In short, Lamborghini, Ferrari, track for F1, high glass buildings –it is a very different city in comparison with local places to eat and markets. By the way, nearby places to eat sometimes have a terrible look for Europeans; for example, how satay is prepared in smoke and fire and all this richly flavored with oil. Week went by like one day, at the same time feels like world cup in Laval was a month ago. I have noticed long ago that eventful life leaves strange dual feeling leaving brain confused. Guang, a lovely local man, was my assistant. He told me everything he knew about Singapore, and I in return shared my thoughts in the style of "about anything and everything". We had a nice time together and it was sad to say goodbye to him. A lot of positive emotions I got from Guang, unselfishly spending his energy on me. Competitions went very well, routes were very suitable. I’ve met many potentially strong guys during the trip. They just need someone to whom they could look up to or coach. Then the progress will not take long. Meeting such organized, friendly and cheerful guys was as a big holiday for a week. Thanks to the organizers who have tried very hard to make this event special and so carefully treated me. Good luck Singaporeans, now a piece of my soul with you. I forgot to mention one more thing. The number of autographs I gave was a pleasant surprise for me, probably, it exceeded a few hundred. I'm very glad that I could finalize this half year with such a good point. I couldn’t even imagine that I am capable of such a beautiful performance. Seems that during the season I spent all reserve of failures and I didn’t have other choice as perform in the way I did. I stated preparation for the competitions long before beginning of the season. At the beginning of January I already started with first conscious training. Winter is a difficult time. You forget that you can do everything, weather is gray and you are not in the mood to strain yourself. Slowly you start noticing the power and enjoying it. It is difficult to understand whether you are ready mentally or not. Competitions are required to correct your psychological training. At first competition you will have a feeling that you missed something important, no matter how hard you were preparing. As if one of many muscles is not strong enough. Anyway, it is too late to worry and doubts bring anxiety. In spite of the fact that I participated in more than 70 world cups, every morning before the competition I experience the same feelings as I had many years ago in the morning of long-awaited birthday. Deep belief in miracle covers me, chills of happiness makes me realize that I live at this exact second. Those feelings are necessary for me. One competition after another.. but I was not quit myself. In some competition I felt special connection with public, which so diligently supported me. I hope that public felt the same way. It seemed to me that sometimes I can pour fluids into audience, creating special contact. Looking into the past of my busy calendar, I am glad that I finished intended in a proper manner. Somewhere I gave up the slack, but at the same time, I flashed a couple of times. I'm not a very busy man, but there is not so much time and I want to do so many things. I always remind myself that it is very important to live a moment that is now, truly love it, and then all the obstacles turn into an endless amusing game. Here is the video from the finals in Laval. 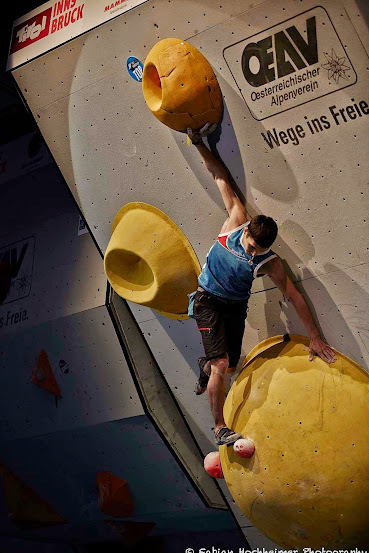 And best of IFSC 2014 with a lot of falls, interesting moves and successful attempts. 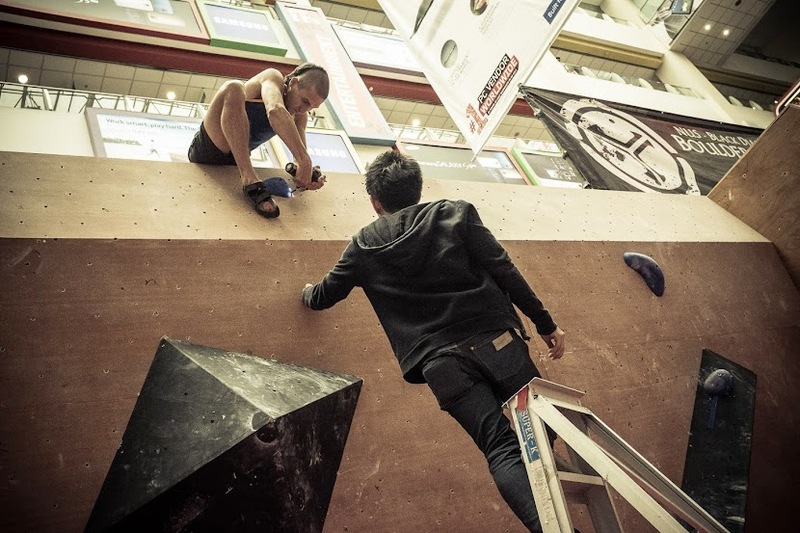 More about bouldering competitions you can find here.